This week’s #3DGuyVRappoftheweek, #VLIPPmed, takes medical education and training to the next level. VLIPPmed is a global platform that uses virtual reality (VR) VR, 360º video or live streaming to educate medical professionals and students. VLIPPmed gives healthcare professionals and students the opportunity to experience immersive medical training, on their phone, by medical experts – no matter where they are in the world. 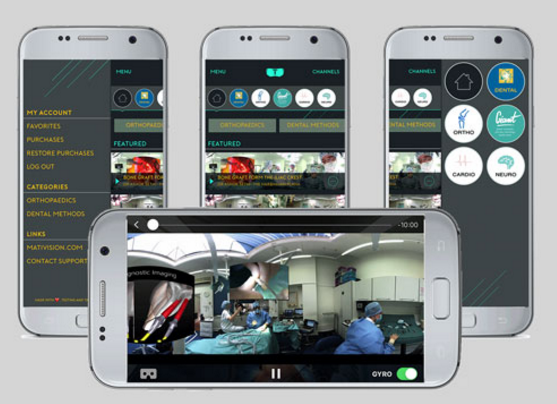 It allows the viewer to virtually be in the operating theater during a surgery. It also offers multiple interactive tools which further enhances the feeling of immersion. It offers an extensive variety of surgeries and is a wonderful way to learn more about a specific medical procedure that you or someone you know may need to undergo. But be warned, some experiences may not be for the faint-hearted! The reason why it carries a 18+ age restriction! The surgeries are captivating and can be quite graphic! It is easy to see why this type of medical training can be so beneficial and effective. You feel like you are in a theatre room watching an actual surgery. The app is free and you don’t need a special VR viewer to take part in this experience – you can use a Google Cardboard or a 3DGuy VR viewer! If you don’t have one, you can order your own 3DGuy viewer here. I really enjoyed this app and found it very educational. Give it a try! You can download the Android app here. I hope you’ve enjoyed all 25 apps and experiences that were featured each week. Check out #3DGuyVRappoftheweek blogs for all past 24 app features. Very innovative! This is the present and future! Also very useful for patients to see what to expect before they go into hospital. We couldn’t agree with you more! We’re very impressed to see the ever increasing benefits of using VR in the medical industry!